The University of Leicester has unveiled plans to build a £14m conference centre by converting a Grade II-listed former hall of residence. The university has been granted planning permission to begin work on its five-acre College Hall site in Knighton, which has been unused since 2005. The project will see the building transformed into a conference facility including one 150-seat lecture theatre, break-out rooms, dining facilities and 117 ensuite bedrooms. Once completed, event organisers will be able to book the venue all-year round. 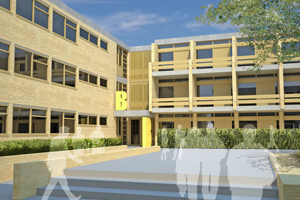 Building work is expected to commence in early 2012 and slated for completion in the middle of 2013. Trevor Miller, conference sales and marketing manager at Leicester Conferences, said: "The project demonstrates and reinforces the university’s commitment to the UK’s meetings industry and in particular the conference market. "The redeveloped College Hall site will be a significant addition to Leicester Conferences portfolio of venues which currently includes residential conference facilities during student vacation periods and year-round day conference availability."